Taking the step up to the British GT Championship is always going to be a big challenge, and for Team Jedi Racing, the challenge was great – new championship, new car, no experience. The team may be new to GT racing, but its two drivers, Rob Horsfield and Frazer Corbyn (right), are both used to leading and winning races. 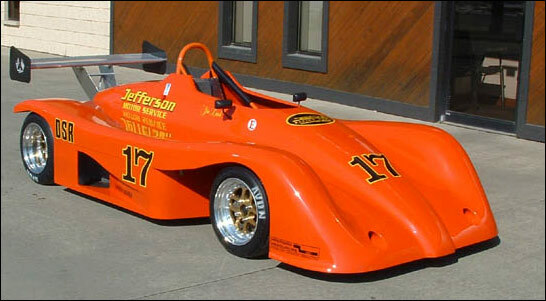 Frazer’s father, John Corbyn, built a car for hillclimb competition back in 1984; the first modern single seater powered by a motorcycle engine. Being eight years old at the time, Frazer was a Star Wars nut and offered the name ‘Jedi’ when John asked him what to call the car (we are grateful that he didn’t suggest ‘Jabba’ or ‘Wookiee’). Since that time, the first car has spawned its own category and race series - Formula Jedi - and highly successful it is too. Devised as a cost effective introduction to slicks and wings racing, a Formula Jedi car boasts fully adjustable suspension, a sequential gearbox, 14,000 rpm, 0-60 in a little over three seconds, weighs 310kg and delivers 150bhp. With this mightily impressive power-to-weight ratio and Avon control-tyres, this series appeals to a wide range of racers; 16 year olds just out of karting, serious club racers, and those just out for a fun weekend of racing. The age-range is large in this series, with the oldest driver clocking in at 67 years. The car costs approximately £25,000 and a full season of racing (16 races at Formula Palmer Audi speeds) can be had for £5-£10,000. The cars also run in the USA as D-Sports racers with a sportscar shell. 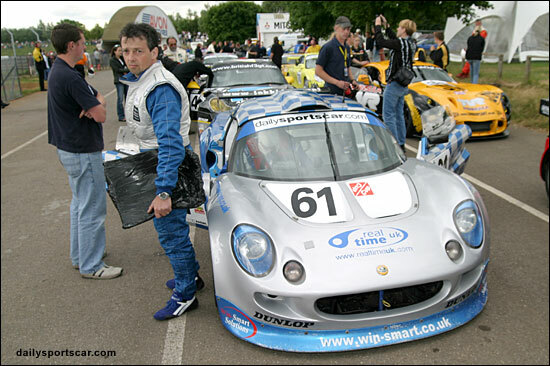 Despite entering the family business (Jedi Racing Cars Ltd) after his Star Wars fixation had ended, Frazer surprisingly didn’t start racing until he was 23; and he started in hillclimbs, winning the British Leaders 600cc National Hillclimb Championship in 1999. In 2000 he started circuit racing in the Monoposto 1200 Championship, taking a win in his first season before winning the title in both 2001 and 2002. At the same time, he drove in Formula Honda (Formula Jedi) taking several wins, despite his car being used as the development drone for the factory. Frazer has known Rob Horsfield (left) since Rob started racing in Formula 600 (Formula Jedi) in 1997. 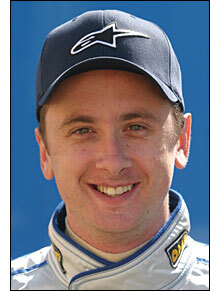 Rob was another late-starter in racing, not coming to the sport until he was into his thirties (Rob’s profession is sales – formerly IT and latterly cars), but he soon made up for lost time. Racing his Jedi mainly in the Monoposto 1200 Championship with a 1000cc engine, he finished runner-up to Frazer in 2002. When Formula Jedi launched a 1000cc category in 2003, Rob decided to enter both Championships; 32 races later, Rob had won 14 of them and taken both crowns. His 2003 record was one of the best in any category of national racing; but for 2004, Rob was looking for a new challenge. He liked the look of the British GT Championship, as it would give him the opportunity both to race in a new branch of motorsport and to race against professional drivers. Thus it was that Rob went shopping for a car at the end of the year. 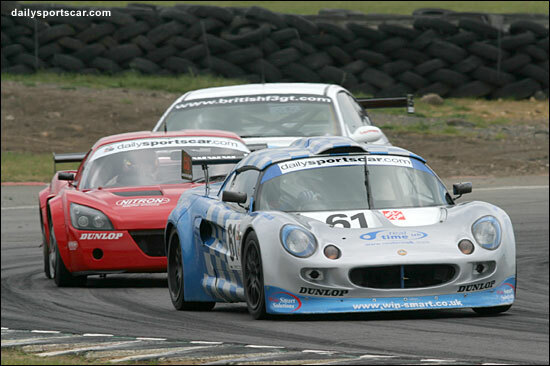 The last race of the 2003 British GT Championship at Brands Hatch suggested that the Lotus Elise was a highly competitive car in the Cup class and Rob had a look to see what was available. 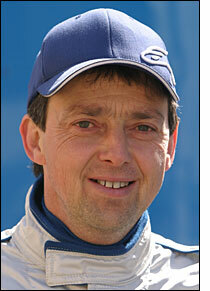 Gavan Kershaw had just won the Lotus Roadsports Championship and had put his car up for sale. Rob tested the car, liked what he found and bought it soon afterwards. Unfortunately, the uncertainty over the Cup class’s future over last winter meant that development of the car was delayed. Once that issue was sorted out, however, Rob assembled his team. Rob asked Frazer to prep. the car and (despite the project being entirely unconnected to Jedi Racing Cars) decided on the name Team Jedi Racing, in homage to his previous car. There would be two other key members of the team. Andy Hoadley is a mechanic with Jedi Racing Cars and is seemingly condemned to spend every waking moment working on engines, perhaps owing to some terrible crime committed in a past life. Thus, he works on Jedis during the day and the Lotus during his ‘spare time’. Paul Kneeshaw’s involvement with the project is rather unusual. A teacher at Weavers School in Wellingborough, Paul instigated the Lunar Racing project, whereby the pupils at the school (which has its fair share of ‘inner city’ problems) prepare and race a Formula Jedi car in the championship, as a way of focussing their energies in a positive and constructive manner. Rob and Frazer invited Paul to get involved with team Jedi and the Weavers pupils (while not directly working on the car) get more valuable insight and experience in race preparation; some pupils also help out in the pits at races. Paul has also made another unusual contribution to the team, having persuaded former Page Three model Jakki Degg to support the team, having met her at Autosport International. Once the team was assembled, the car was fitted with a new engine and a Quaife six speed sequential gearbox. It was also given its new and very distinctive colour scheme. 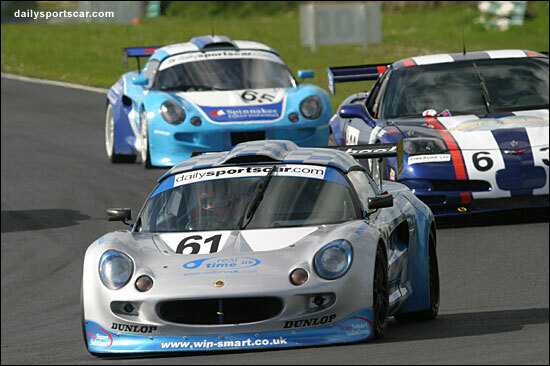 With valuable support from Central Autos, in the form of race consumables, the team went racing. While the season has been a difficult and often frustrating one for this new team – the challenge of converting the car from a twenty-minute sprinter to a one-hour endurance racer has been greater than anyone envisaged – both drivers and both mechanics are determined to succeed at this level of motorsport. Let it be noted that the team have attended every race, often in the face of enormous difficulties, while several other teams have fallen by the wayside. Team Jedi Racing is known as the friendliest team in the paddock, but that is not why they are there. They want to succeed and get to the front and they deserve to be there. We look forward to welcoming them back in seasons to come.